Note the missing accent in the fourth word of the Greek. It should be δαίμων. 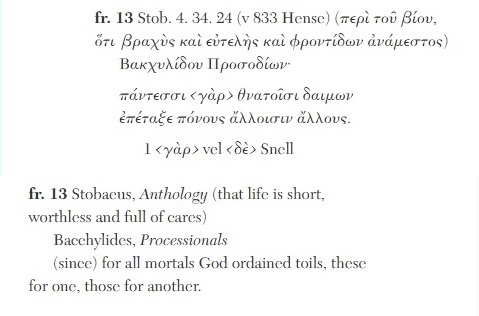 I don't have access to the physical book—David A. Campbell, ed., Greek Lyric, Vol. IV: Bacchylides, Corinna, and Others (Cambridge: Harvard University Press, 1992)—so I don't know if the accent is missing there as well. According to the Teubner text, Robert Renehan conjectured <τοι> as the second word. ordained toils, these for one, those for another.